The Defendant was merging from the right lane into the left lane when he struck the Plaintiff’s motorcycle. 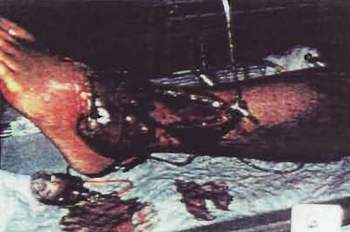 The Plaintiff subsequently hit a guardrail, resulting in a de-gloving of his lower left leg as well as multipIe fractures of the left foot. The Plaintiff sought recovery for his injuries, in addition to reimbursement for $105,000 in medical bills, $30,000 in lost wages, and impaired future earnings. The experts agreed that the Plaintiff would require future surgery to fuse the bones in the left foot. The defense successfully argued comparative negligence by the Plaintiff in addition to defeating his impaired future earnings claim.